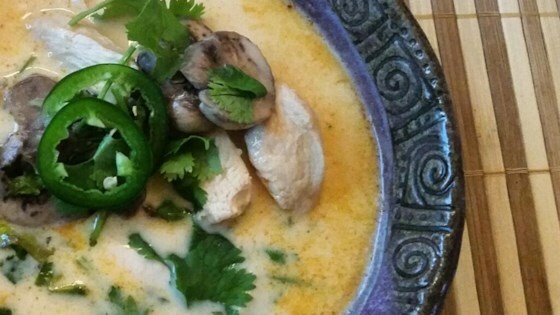 "Most of the ingredients for this Thai-inspired soup can be found in the supermarket. The red curry paste is spicy, but by controlling the amount of paste you add, you can tailor this to your own threshold of pain." Stir lemon grass, garlic, and ginger together in a large stock pot over medium-high heat. Stir in chicken broth and bring to a boil. Reduce heat to low and simmer for 30 minutes. Strain chicken broth and set aside. Discard lemon grass, garlic, and ginger. Heat vegetable oil in a large soup pot over medium heat; Stir in chicken; cook and stir for 5 minutes. Stir in mushrooms and cook for 5 more minutes. Stir in red curry paste, fish sauce, and lime juice until combined. Stir in chicken broth and coconut milk; return to a simmer and cook on low for 15 to 20 minutes. Skim off any excess oil and fat that rises to the top and discard. Stir red onion into the chicken mixture; cook and stir until onion softens, about 5 minutes. Remove from heat and add about 1/2 the cilantro. Serve with plates of cilantro, lime wedges, and fresh sliced jalapenos. The only exotic ingredient would be the fresh lemon grass. I've found most large grocery stores do carry it, but if not, you can substitute a few tablespoons of lemon zest. The nutrition data for this recipe includes the full amount of the ingredients in the broth. The actual amount of the marinade consumed will vary. Really good! I poached this chicken in the broth but did everything else as written.